Akiba Blue 1st appearances is on "Hikonin Sentai Akibaranger" series. Akiba Blue as one of the "Hikonin Sentai Akibaranger" team member is a high school student. Not only that, she also a martial arts user. In the series She helps Akiba Red and Yellow when they are in trouble. The design of the suit is very unique. The helmet comes with a ponytail and equipped with scarf. Here are some snapshot of the AFA 2012. Thanks to Willys for the photos! Kyouryu Greeed 1st appearances is on "Kamen Rider OOO (Ozu)" series. Dr. Maki when is possessed by the Putotyrano medals, he transforms into Kyouryu greed. I have compared between Kyouryu greeed and Eiji greeed. The comparison can be seen in here. So far in the series, Kyouryu is the most powerful greeed. Eiji Greeed 1st appearances is on "Kamen Rider OOO (Ozu)" series. Eiji Greeed is a form of new greeed from Eiji. This form just appear once in the series when he fights with Ankh (complete form). This form actually looks similar with the Kyouryu Greeed. Den-O Sword Form 1st appearances is on Masked Rider Den-O series. Masked Rider Den-O Sword Form is the First combination form from Maksed Rider Den-O. It's a combination between the blank Form and Momotaros Imagin (イマジン). Using sword is the main speciality of this form. It comes with a red color armor and a peach looks a like masked. Meteor 1st appearances is on Kamen Rider Fourze series. Meteor! as a side rider from Kamen Rider Fourze series comes with a very unique design. I really love this the design and the color scheme. Apparently, the way he fights is mimicking the famous and legendary fighter - Bruce Lee (Jeet Kune Do). I really love side rider story in every kamen rider series. This is one of my favorite's side rider after Ixa, Gills, Another Agito, Birth and Accel. This cool figure comes with the same mold as S.H.Figuarts Fourze. Nadeshiko 1st appearances is on "Kamen Rider × Kamen Rider Fourze & OOO: Movie War Mega Max". What an interesting first female rider that is released in S.H.Figuarts masked rider/kamen rider line. The design is quite unique as in it's like a female form of kamen rider Fourze. 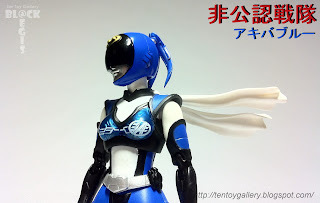 The primary color of this figure is metalic silver with a metalic blue as the secondary color. As usual the female rider have a shorter height compare to the rest. Knight 1st appearances is on "Kamen Rider Ryuki" series. Knight as the second main rider in the series has sealed contract with Dark Wing as the mirror monster. This is cool figure released after Ryuki and come with the Contract monster too. Raia 1st appearances is on "Kamen Rider Ryuki" series. This time I will give my opinion on this figure Kamen Rider Raia. The base of the design is from a Stingray. It's color comes with a glossy pink color. Too bad this rider only appear for a while in the series after being killed by Ouja. His contract monster is a Stingray called "Evildiver" and later will be own by Ouja after he defeats Raia to form Genocider.